Lake Mummelsee, located along the Black Forest High Road scenic route, is the largest of seven mountain lakes remaining in the Black Forest. Perched 3,400 feet (1,036 meters) above sea level, the lake gets its name from the white water lilies, called ‘mummel’ in German, than float on its surface. According to local lore, a bevy of water sprites live with their king in a glorious crystal palace far below the surface of the water, coming out only at night to dance in the moonlight. Mermaids aside, Lake Mummelsee is circumnavigated by a boardwalk for lakeside strolls, while paddle boats ply the surface. A short trail leads up to a lookout tower atop Hornisgrinde, the highest peak in the area, where visitors can take in panoramic views of the Black Forest. Lake Mummelsee is located along B500 between the villages of Unterstmatt and Ruhestein. Visit the sophisticated spa town of Baden-Baden in Germany’s Black Forest on this guided, full-day sightseeing adventure from Frankfurt. Explore the town’s elegant tree-lined avenues, see the grand buildings and visit the chic boutiques alongside the legendary thermal bath houses. See some of the popular local attractions, like Kurhaus of Baden-Baden. 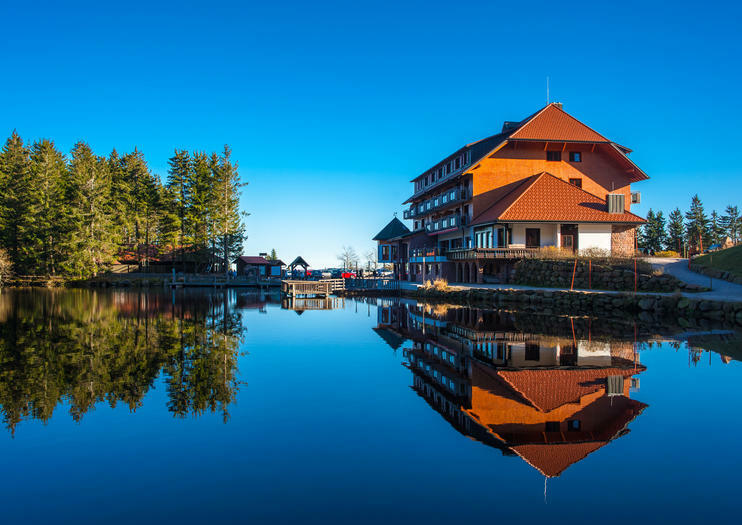 Take a tour of this spa resort, casino and conference complex, then enjoy a relaxing drive to the Mummelsee, a popular lake in the Black Forest near Seebach. Round-trip luxury coach transportation from Frankfurt included. Visit the cities of Heidelberg and Baden-Baden on this guided, full-day sightseeing adventure from Frankfurt. First, explore Heidelberg, Germany’s oldest and most famous university town. See the Gothic landmark Heidelberg Castle and the bustling Old Town district that runs for one mile along the Neckar River. Then visit the spa town of Baden-Baden in Germany’s Black Forest. Travel through the region, famous for its production of traditional German cuckoo clocks, and see some of its popular attractions. Round-trip coach transportation from Frankfurt included.